SYNOPSIS: Two wild Olsen and Johnson comedy classics! Long before films like Airplane! and Naked Gun (not to mention Mel Brook's Silent Movie) this film presented so many rapid fire jokes and gags that audiences had no time to catch their breath! 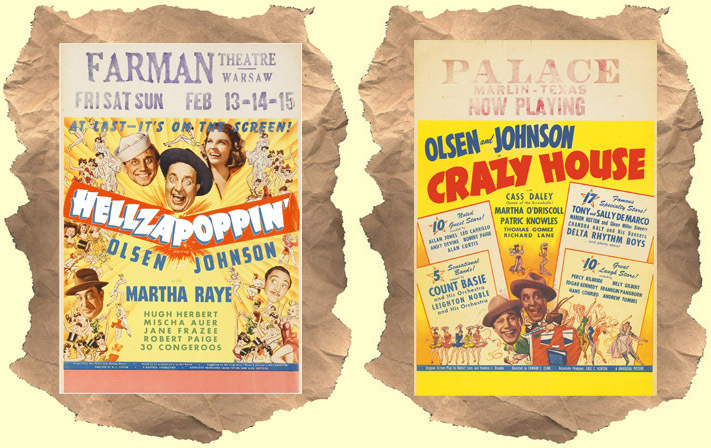 Hellzapoppin': Completely off-the-wall comedy from forgotten comedy team Olsen and Johnson that's like a Marx Brothers film on crack! Just take a look at that wild cast. The film starts off in hell and works it's way to Hollywood. Vaudeville style jokes, singing, swing dancing, sight gags, talking to the audience, goofy film effects (reverse speed, frames out of sync, etc). Even wilder than you've heard. Crazy House: The lesser know, even crazier, sequel that some people like even more than the infamous Hellzapoppin'. More anarchy with Olsen and Johnson as they try to raise money for a movie and end up doing it independently. In this one Cass Daley takes over for Martha Raye with her goofy singing and dancing. *For more wild comedy see: Best of Honker Video, Shelf Life, Record City and Gizmo!